Today I noticed that the buttons in my Windows forms app were being scaled. As you can see from the image below there is a ghosting around the edges of the lines which isn’t in the original image. The graphics object has a correct DPI of 96, but the image DPI is 95.91039. This incorrect DPI value is what is causing the scaling. The image was created in Paint.NET so that was the first thing to check. The DPI settings can be found in the resize dialog, and it was indeed wrong. The DPI in Paint.NET settings is correctly set to 96 so it is unclear why the DPI has been set incorrectly. So, simple fix, just change it to 96 and re-save right? Wrong. 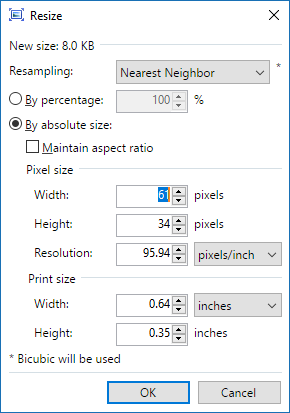 Reloading the image in Paint.NET now shows 95.99 DPI. Close but still not right. Interestingly GIMP appears to have similar accuracy problem with displaying and loading/saving the DPI. Even after this change, loading the image in .NET still shows a DPI of 95.91039. Unfortunately this doesn’t help either. It appears that the png is at the correct DPI (or close enough with whatever rounding is going on). The problem lies with the .NET Image class. I assume that this is a bug in the image loading code when the image is embedded into the resources file. This fixes the problem and now my button images are pixel perfect!